It’s been a busy week on the USV news front. On Tuesday we rolled out our new thesis and yesterday we announced our latest investment, ShopShops. I was talking to a young woman this week who we are interviewing for our two-year analyst program. I asked her why she was interested in working at USV. She told me she liked that we posted our investment memos on our blog so that everyone knows why we made the investment, how it fits with our thesis, and why we are excited about it. That is something we have been doing since the early days and is core to how we approach investing at USV. You can go back and look at what we were thinking when we invested in Twitter, Twilio, Cloudflare, Coinbase, and pretty much any USV investment. We don’t write investment memos for the files at USV, something I used to do at earlier VC firms I worked at. We just write them to the world. It puts our thinking out there and it stays there in perpetuity. So yesterday Rebecca did that for our newest investment, ShopShops. I like to think of ShopShops as what QVC would be in a global decentralized world where everything is live streamed on our phones. Basically, hosts go into stores and livestream shopping experiences to viewers all over the world who can buy from stores they aren’t able to shop in. 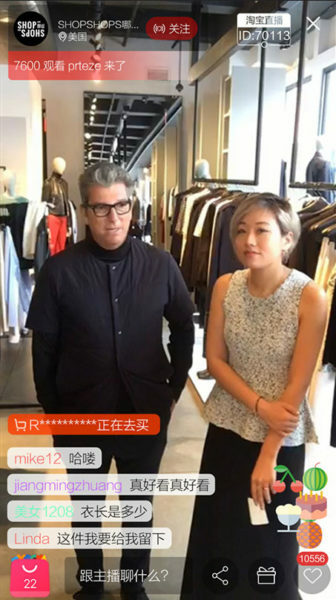 This is a screenshot of ShopShops founder Liyia Wu doing a shopping event for viewers in China. Time will tell if our investment in ShopShops lives up to everything we are expecting from it. But I am excited by this idea, this founder, and this investment and I am thrilled we made it and told the world why. Yesterday morning something amusing happened. My friend and I were headed out to go skiing and we both got texts from our children asking for the logins to our cable accounts. I thought to myself that there must be tens of thousands of those text messages being sent at that moment. Many of our adult children don’t have cable television. They stream their media over their laptops and AppleTVs. And so when something big like the Olympics comes along, they head over to the network’s streaming services and they need to log in with their cable television credentials. Which, of course they don’t have. But their parents do. This has been going on in our family for some time, but I realized yesterday that this goes on in many families these days. The parents are still on cable, the kids are not, and at times, the kids need their parent’s logins. The entire system is kind of whacky and designed to preserve the cable company’s relationships with the networks. It works, but it is clunky, and easily worked around. I wonder how long this charade will continue before a better model emerges. Livestreaming is everywhere. Twitch, YouNow, YouTube, Periscope, Snapchat, Facebook, and many many other services allow you to broadcast what you are doing to the world and let anyone and everyone watch it. But how do you discover the best live content when there is so much of it and the streams can last hours, if not longer? Enter our portfolio company Oddshot.tv. Oddshot allows anyone who wants to capture the last 40 seconds of what they are watching on their computer and share it with the world. Oddshot recently released a desktop app for Windows that makes this super easy. They also have browser plugings for Chrome and Firefox and mobile apps for iOS and Android. You can get these downloads here. The front page of Oddshot.tv is like Reddit for livestreams. You can quickly scan what has happened and watch the clip. If you like the clip, you can go watch the stream or follow the streamer. If you are into livestreaming or want to get into it, check out Oddshot.tv.